I recently had a fascinating evening with Maryclare Foa getting our portraits drawn by Patrick Tresset‘s robots at Platform Southwark, part of the Merge Festival. A camera looks at you then down at the drawing. The programming is based on Patrick Tresset’s own left-handed drawing style. Interesting to see the variations. The angle of the pen makes a difference, so do light levels. The lines are gestural because of being drawn by robot arms. The signatures are taken from a random, unintended mark that one of his robots once made. Me and Maryclare Foa drawn by the same robot. We both look very suspicious! Maryclare Foa confronts the robot and draws it back! In the installation upstairs, Human Study #4, there is a classroom of performing robots. A camera at the front desk seems to communicate to the robot arms at the desks in morse code. The robot arms mark time along with the instructions on the video blackboard. Finally, all but two start scribbling over their previous marks. The sound of the servo motors and the bleeps of morse code sound incredible. The whole set up brought back uncanny memories of my primary school. 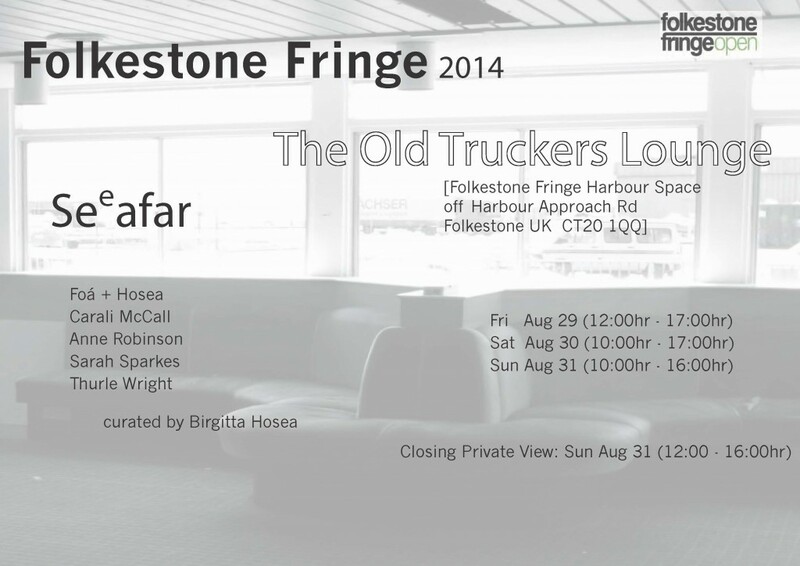 Taking place in a former waiting room for the Folkestone ferry, SEeAFAR features six artists – Foa + Hosea, Carali McCall, Anne Robinson, Sarah Sparkes, Thurle Wright – whose work manifests absence. Through drawing, painting, installation, performance and moving image, these artworks recall the perspective of generations of women living in a state of unknowing as they wait for news or the return of loved ones from overseas and explore the tensions between anticipation and memory, separation and speculation. Join Facebook event by clicking here.